What is a "Caipirinha"? Is it a dish? Is it clothes? Is it a TV show? Today I bought some ingredients for making a "Caipirinha," a cocktail of rum and a lime. 1. Cut a lime into the desired size. Then put it into a glass, and crush it. 2. Add a few teaspoons of sugar in it. 3. Pour 30~45 ml of rum. 4. Put a lot of ice into the glass. Its taste is not so sugary, but very fresh. Truly, Caipirinha is made of the liqueur "Cachaca," however, there wasn't any Cachaca in my local supermarket. Rum is the substitution. Cachaca is made from sugar cane. The process of making Cachaca is squeezing sugar canes, fermenting their juice, and distilling the juice. It is a little bit different from rum. 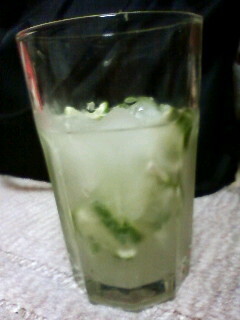 If you have an opportunity to drink a Caipirinha, please try it.